It’s already mid February and the next fun holiday is quickly approaching…President’s day is on Monday! Oh wait….yep, I meant Valentine’s day which is this Thursday 🙂 Speaking of President’s day though, all you bankers and state employees enjoy that holiday off work! It’s a good thing I really like my new job, because I do miss the perk of bank holidays! I’ve always loved Valentine’s day, but having Hailey around since I started dating Allen has made the holiday that much sweeter. I was always so excited when we had her on the actual holiday so I could plan fun things to make her feel extra, extra loved that day! My first blog has all the good details on our favorite Valentine’s day memories like heart shaped cinnamon rolls, a heart of post-its with sweet notes written on them stuck to her bathroom mirror, heart shaped bacon, cherries, pink pasta with Alfredo sauce, flowers, balloons, little DIY gifts and mock champagne (just one 2 liter of Gingerale and 1/2 can frozen white grape juice concentrate, thawed) So fun! And of course dinner on Valentine’s day always has to end with dessert (we don’t typically have dessert after dinner). 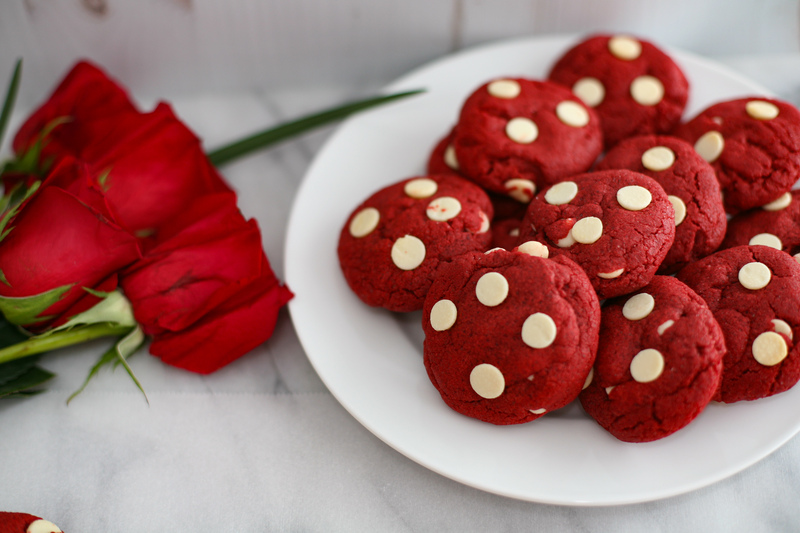 Sometimes I baked a cherry pie, other times we went with the classic chocolate covered strawberries and then a few years ago I found this amazing recipe for red velvet white chocolate chip cookies and well…now it’s just tradition. I’ve seen red velvet cookie recipes before, but they always seemed to use a cake mix and I’m just going to admit it now that I’m a little snobby when it comes to boxed anything and my dear Grandma is the one to blame! Although, ironically she’s still perfectly okay with boxed mixes from time to time even though she bakes from scratch often! At any rate, I was thrilled to find this recipe that doesn’t call for cake mix of any kind! Did I use that right? I keep wanting to add that phrase into my conversation after hearing it from multiple people lately. First things first with these tasty little cookies. You’ll want to start by mixing the flour, cocoa powder, cornstarch, baking soda and salt together and setting that aside for later. Next, use a stand mixer to cream together the butter, shortening and sugar until fluffy. Slowly add egg yolk and egg and mix to combine. Then add your vinegar, vanilla and food coloring. Lastly, use a tablespoon to scoop out the dough and place on a parchment paper covered baking sheet! You can choose to gently press a few chocolate chips in the top of the cookie at this point if you want a little extra chocolate and some decoration on the top of the cookie! Bake them for about 8, maaaybee 9 minutes and then take them out and let them cool! And please, please….eat one just out of the oven, carefully of course, but they are SO good when they’re still warm. I may have eaten three before I even got around to taking photos for this post! Not mad about it, friends! reading and drinking hot cocoa…oh my gosh, is anyone else as “behind” as I am in the reading department? In a medium mixing bowl, combine flour, cocoa powder, cornstarch, baking soda and salt. Set aside. Using a stand mixer, cream together butter, shortening and sugar until fluffy. Slowly add egg yolk and egg and mix to combine. Add vinegar, vanilla and food coloring and mix until combined. Gradually add dry ingredients while mixing. Once combined, remove bowl from stand and fold in ½ cup white chocolate chips. Scoop out cookie dough using a tablespoon. Press 3-5 white chocolate chips onto the top of each cookie dough ball being careful not to flatten the cookies. Bake for 8-9 minutes. Transfer to a wire rack to cool and keep the cooled cookies stored in an airtight container. This entry was posted in Dessert, Recipe Book and tagged cookie recipe, cookie recipes, cookies, dessert, dessert recipes, easy cookie recipes, red velvet, red velvet cookies, red velvet white chocolate chip cookies, simple dessert recipes, valentines day, valentines day dessert recipes, valentines day ideas, valentines day recipes, white chocolate. Bookmark the permalink.